Obituary – Young, Dorothy May (Warner) « Perry High School Alumni Association, Inc.
Mrs. Dorothy May (Warner) Young, 96, retired school teacher, died at 8:05 a.m. on Thursday in the Barnsdall Nursing Home. Graveside funeral services for Mrs. Young will be held at 2:00 p.m. on Saturday, December 18 in the Grace Hill Cemetery, Perry, Okla. Mr. Steve Butler, her former pastor, will be the officiant. A Memorial Service will be held at 2:00 p.m. on January 17, 2005 at the First Christian Church in Barnsdall, Oklahoma. Committal prayers and interment will be directed by the Arnold Moore-Barnsdall Funeral Home. Mrs. Young will lie in state in the Arnold Moore-Barnsdall Funeral Home where friends may call for their visitation until she is removed for graveside rites on Saturday. Dorothy May Warner was born on May 22, 1908 at Perry, Okla. She was the daughter of the late LeeRoy and Adalene (Leuhe) Warner. She was reared and received her education in the Perry, Okla. community schools and was graduated with the Senior Class of 1926 from the Perry High School. She continued her education and attended Central State University, Edmond, Okla. where she received her degree in Education in 1930. She and Joseph Wayne Young were married on July 26, 1931 in Perry, Okla. and they made their first home in Nelagoney, Okla. where Mr. and Mrs. Young both taught school in the Nelagoney community from 1931-1936. Mr. and Mrs. Young were school teachers in the Delaware, Okla. community schools for the following five years. Mr. Young was enlisted in the United States Army during World War II from 1941-1946 and during his tenure of service, Mrs. Young taught school in various school districts in Oklahoma. Following Mr. Young’s discharge from military service, he and Mrs. Young taught school in Tulsa and Coweta, Okla. from 1946-1948 and from 1948-1963, they taught school in Kaw City, Okla. They were retired from their chosen field of teaching in 1972 after having served the Barnsdall Board of Education from 1963-1972. Following their retirement, they traveled Europe and the United States. 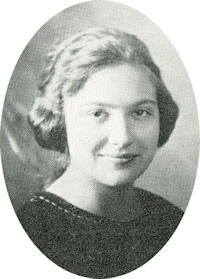 Dorothy later served the Barnsdall community as Librarian for the Ethel Briggs Public Library. Mr. Young preceded her in death on August 19, 1998 and since that time, Mrs. Young has continued living in the Barnsdall community in retirement. Dorothy was a member of the First Christian Church of Barnsdall. Surviving Mrs. Young are one son, Dr. Jerald Wayne “Jerry” Young, New York City, New York and two granddaughters, Ms. Kristen Jackson and her husband David, Raleigh, North Carolina and Ms. Timara Freeman Young and her husband Ehren Berger, Olympia, Washington and her caregivers, Patricia Wheeler and Katie Matlock. She was preceded in death by her father; mother and husband.